Picking up right where we left off last week, “The Handoff” answered a few questions left hanging without getting to the big ones. For instance, we learned that the real Veronica Deane is far more receptive to early morning cocktails than her imposter, and, less importantly, that her lawyer (voiced by Patton Oswalt) wasn’t the one behind the fake out. That person remains unknown, even after Archer got the drop on was nearly killed by the group who was hired to blackmail attorney Alan Shapiro. The mercenaries didn’t know who hired them, leaving The Figgis Agency in the dark as to who screwed up provided their first case. The “Corpse Reviver No. 2,” as Veronica Deane orders just before 12pm ET (in Los Angeles), is widely regarded as the best of the Corpse Reviver cocktails. There have been a number of varieties — or numbers, if you will — lost to time, but the original CR & CR No. 2 have survived to this day as hangover cures. Veronica’s order is made with equal parts gin, Cointreau, Lillet Blanc, fresh lemon juice and absinthe with an orange peel garnish — though it appears that Archer skipped the final decorative touch. 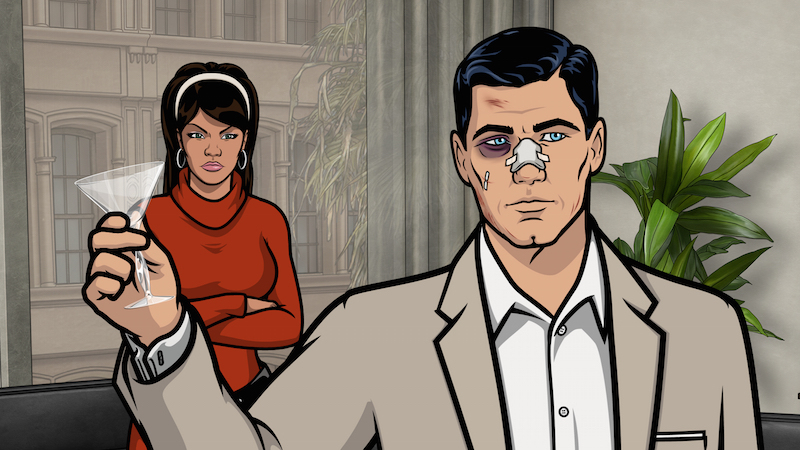 Like the boy who cried “Wolf!”, we’ve been waiting for Archer’s running voicemail gag to come back and bite him in a big way for years. This wasn’t exactly that moment, though the scene itself was perfect from top to bottom. Mallory prefaced calling her prank-loving son by flat-out refusing because of his elaborate voicemail messages, but the need outweighed her annoyance eventually, as The Figgis Agency had to get a status update on the handoff. 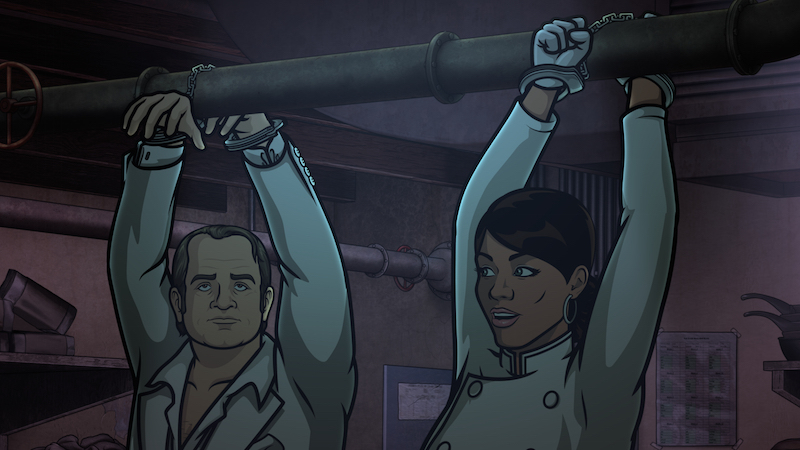 Instead, they got Archer caught and nearly killed, all of which the five Figgis employees listened to with inappropriate nonchalance. Phrasing is back! Woo hoo! 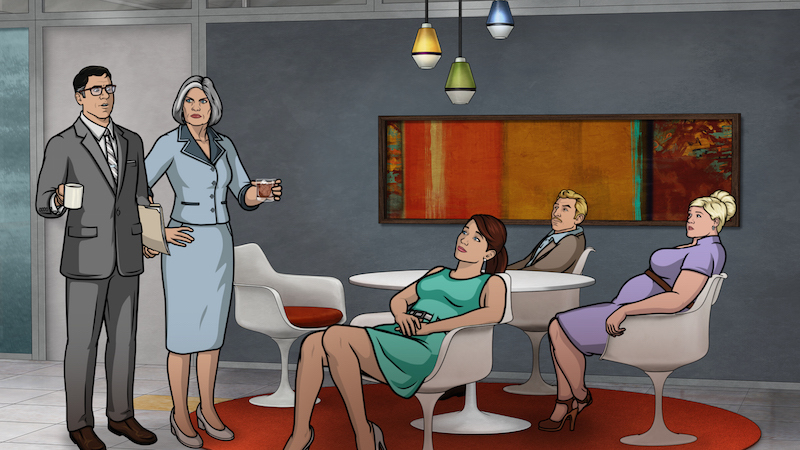 And just in time, considering Pam’s gratuitous, “That’s what she said” retort to Lana and Archer’s “thanks for coming” remarks. Point made, Mr. Reed, but we need phrasing back for more reasons than just Pam’s on-the-nose stab at humor. Gotta love Pam, though. Perhaps Archer and Lana should have been tipped off toward Alan Shapiro’s backstabbing nature when, ever after going on an epic rant about the anguish inflicted on his dogs by the inadvertently poisonous Hush Puppies, his primary concern was the fate of his Flokati Rug. It’s basically a white shag rug — and very much in line with Shapiro’s decorative white-on-white theme (one which Mallory would undoubtedly be envious of) — but the imported Greek floor coverings can be as expensive or as cheap as you want. We’re guessing this loaded lawyer spent a pretty penny on his, but no matter how much it cost, a statement of wealth should never outweigh the love for your beloved guard dogs. Though, really, it’s the entire non-voicemail scene. But that’s impossible to transcribe. Perhaps what’s most encouraging about “The Handoff,” a rather straightforward mission-focused episode of “Archer,” is what it doesn’t do. 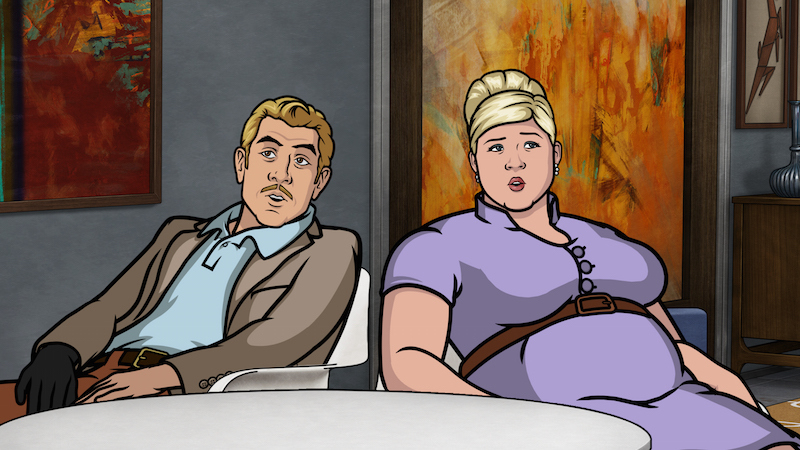 Despite plenty of lingering queries after the Season 7 premiere, its follow-up episode didn’t answer the two biggest question marks: We don’t know who was responsible for tricking The Figgis Agency investigators into stealing Veronica Deane’s “sensitive information,” and we don’t know how Archer ends up floating face-first in her pool. Obviously the two are connected, but “Archer” verified in Episode 2 what we suspected after Week 1: Solving our hero’s murder is no quickie. This one’s going to last all year.